MeltView welding cameras,now available in Australia through SMENCO deliver safety and work efficiency during welding processes. 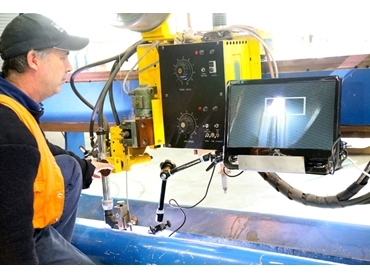 Welding flash burns are all too common in Australian industry as operators working on automated welding systems try to get as physically close as possible to visually monitor the work, exposing themselves to high levels of risk. Welding flash injuries can result in employee hospitalisation, loss of productivity and costly downtime. MeltView is a range of remote vision welding camerasthat allow welders to ‘see’ what they are welding from a safe distance, making the worksite a whole lot safer while accomplishing the job better.MeltViewwelding cameras can make inaccessible or dangerous automated welding safer and more effective. The welding camera fulfils OHS requirements by protecting welding operators from hazards including fumes, radiation, heat, burns and awkward positions.MeltView comes with various customisation options for better integration of the camera into the welding machine. Built to work in hostile applications, the cameras resist potential failure issues found in fusion welding including fumes, spatter, condensation, heat, electromagnetic interference and high frequency voltages. Originally developed in New Zealand and now manufactured in the USA, the MeltView range of cameras from MeltTools is distributed by SMENCO, Australia’s leading distributor of welding equipment, consumables and associated welding technology from around the world. Managing Director of SMENCO, Anthony England explains that the cameras will help minimise operator risk involved in weld monitoring, making the workplace a much safer place. MeltView welding cameras find use in the aerospace, energy, industry and oil and gas sectors as well as in billet cutting, horizontal bore cladding and internal pipe cladding applications.